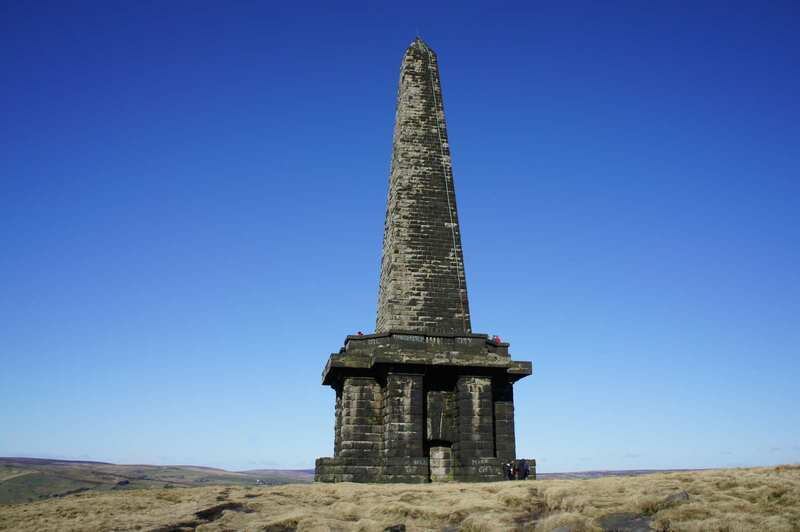 While here in Todmorden why not visit the famous Stoodley Pike Monument. Overlooking the delightful town the Pike boasts magnificent views, from there you are able to see Mankinholes and all the rest of Todmorden. The monument stands at a whopping 121 foot tall (37m) making it dominate the moors and hill tops above the town. The monument was designed in 1854 by local architect James Green, and completed in 1856 at the end of the Crimean War. Stoodley Pike Monument contains a spiral staircase of 39 steps, accessed from its north side. During repairs in 1889 a grill was added to the top step, allowing more light in, so that only 6 or 7 steps are in darkness. There are no windows. The entrance to the balcony, the highest point that can be reached, and some 40 feet above ground level, is on the west face. Many fell races visit the Pike, primarily those organised by Todmorden Harriers including the Noonstone, Hebden Bridge, Shepherd’s Skyline and the Stoodley Pike Fell race. The Pennine Way (Britain’s first National Trail, opened in 1965) passes Stoodley Pike. Stoodley Pike Monument can be easily seen on the horizon, when one stands in front of Beacon Hill, in Halifax, West Yorkshire.